Pope Francis is the first non-European, Jesuit man to be ordained as leader of the Roman Catholic Church. This biography takes middle-grade readers on Jorge Mario Bergoglio’s spiritual and physical journey toward the papacy. Gormley charts Bergoglio’s spiritual development well, beginning with his grandmother, who sparked in him the importance of faith at a young age, and moving from there as political turbulence roiled Argentina. The author provides plenty of context for Argentina’s political and social discord but never loses focus on her subject. While Argentina’s story is important to Bergoglio’s history, it never overwhelms the man. 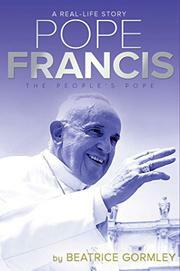 Pope Francis’ reputation as the “People’s Pope,” a man honest about his background, interests, and past, helps the author paint a picture of her subject as a well-rounded, well-intentioned man. There are no grave missteps or shady secrets to reveal here, just a man who always did what he thought was best for the people around him and used his faith as his guide. It is a bit long-winded. The 257 pages of main narrative really hold only about 175 pages of essential story. The “and then this happened” structure of standard biographies is certainly felt, and while that works well for an educational text for children using this for a school project, those looking for a ripping yarn about the pope may want to keep looking.